To determine if Abraham Lincoln is taught in European schools is a task almost impossible to undertake. There are no comparative studies, and in spite of homogenizing efforts through the Bologna process, the educational systems remain vastly different. To look at all the English, history and political science textbooks in European schools is a major research project which might reveal some interesting insights into what kind of American Studies content is taught, but it would go beyond the scope of this brief paper. Therefore, this paper provides a German perspective on how and in what context American history in general is taught in German high schools, specifically in grades 11 to 13. It focuses on Abraham Lincoln as a potential subject in this context and concludes with some ideas on how and why Lincoln could be taught in the EFL, history or political science classrooms. Textbooks frequently used in German schools have been reviewed for that purpose. 1Even in Germany such a study proves difficult. Education is a state matter which means sixteen states (Bundesländer) have sixteen curricula. The overall goals and themes overlap, but teaching materials vary. German schoolbook publishers provide different editions of their textbooks in each state depending on state requirements. Some states have begun to develop joint curricula, but most have not done so. 2In order to establish some data for this paper, I polled a group of 60 high school teachers in May 2009 at a U.S. Embassy organized national American Studies conference. The participating teachers of English (EFL), history and political science came from 14 (out of 16) German states. They provided a reliable source of information, though a hightened interest in U.S. culture and politics due to their participation in the conference could be expected from this group. I wanted to find out to what extent American history content is being taught and if anybody had taught Lincoln in the context of the bi-centennial this school year. Out of 60, 57 questionnaires were returned. The ad-hoc poll was preceded by a survey of several textbooks widely used in both the EFL classroom and in history lessons. Though not representative (the samples are too small), the results show that American History is hardly taught systematically in grades 11 through 13. 3Kursbuch Geschichte (Course Book History) used in three states (Berlin, Brandenburg and Mecklenburg-Vorpommern) covers American history only in relation to German history and adds a global perspective. The Cold War is covered, Lincoln is not. New Context (2003), an EFL textbook, includes the Declaration of Independence, the Bill of Rights and the Gettysburg Address. It features a picture of the Lincoln Memorial next to several other symbols considered to be American in the context of a student task “Identify the Symbols.” (166) There is no further background provided on Lincoln, and one wonders what students will identify. 4 The textbook comparison indicates that it is mainly in the EFL classroom that American history is addressed. This is not surprising when one looks at the time span history lessons have to cover in grades 11 through 13. The subtitle for the textbook Geschichtsbuch Oberstufe (History Secondary Level) reveals it: “From Antiquity to the End of the 19th Century.” Lower grades cover the American revolution, yet, as the title Invitation to History, Vol. 1: From the American Revolution to the First World War, Designed for the Bi-lingual History Classroom Starting with Grade Seven, indicates: almost 150 years are covered in this textbook (Geschichtsbuch Oberstufe). 5The poll conducted among teachers at the National Teacher Conference confirms that American history has its place mainly in the EFL classroom. 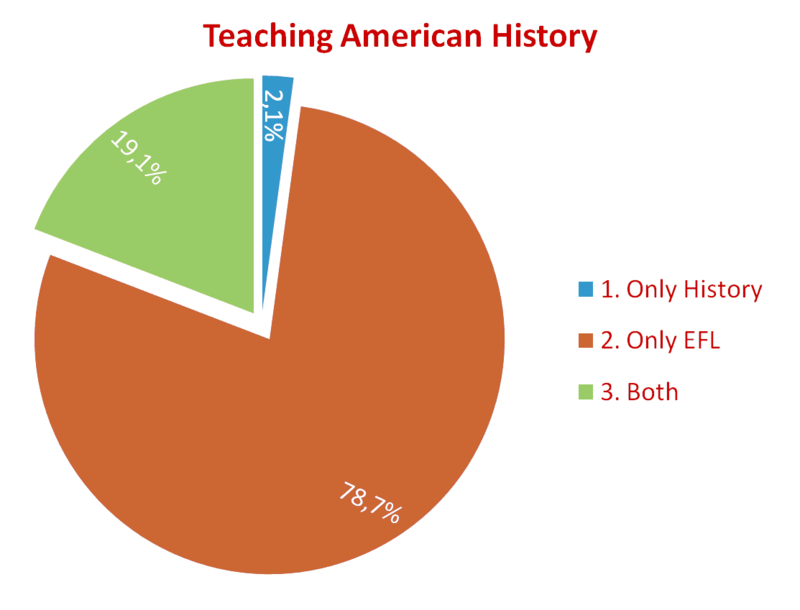 When asked, “Do you teach American history?”: 78% responded that they teach American history in the EFL classroom, 2% teach it in the history classroom, and 19% in both the EFL and the history classroom because they happen to be certified teachers for both subjects. The second question referred specifically to the Lincoln Bi-Centennial: “Have you included the Abraham Lincoln Bi-Centennial in your teaching?”: 29.5% responded with “yes,” 70.5% answered “no.” When asked in what context they had been teaching Lincoln, participants listed the Gettysburg Address and Southern history and identity. Of the 17 teachers who claimed to have taught Abraham Lincoln in the school year 2008, ten had participated in the U.S. Embassy Teacher Academy which had focused on Lincoln six months earlier. 6The conclusion is: Considering the close ties the U.S. and Germany (particularly West Germany before 1989) developed after World War II, what students actually learn about U.S. history is not much. This impression is confirmed by a comparative study on national images of Great Britain and the U.S. which Sylvia Schulze conducted for her M.A. thesis in grade 11 at two schools in east Saxony. She analysed how familiar German students were with national images of Great Britain and the U.S. The author grants the students a basic understanding of U.S. institutions and politics. However, a deeper insight into U.S. culture and history that is not based on a stereotypical view is lacking. The students’ biased views are mainly formed by German media consumption, she claims. Yet, the study reveals that the students recognize Abraham Lincoln as a prominent and important American politician. 7When students were asked to list some “important British and American politicians,” President Lincoln came in as number five on the American list after George W. Bush, John F. Kennedy, Bill Clinton, and George Washington (“bedeutende Politiker” [important politicians] 115). 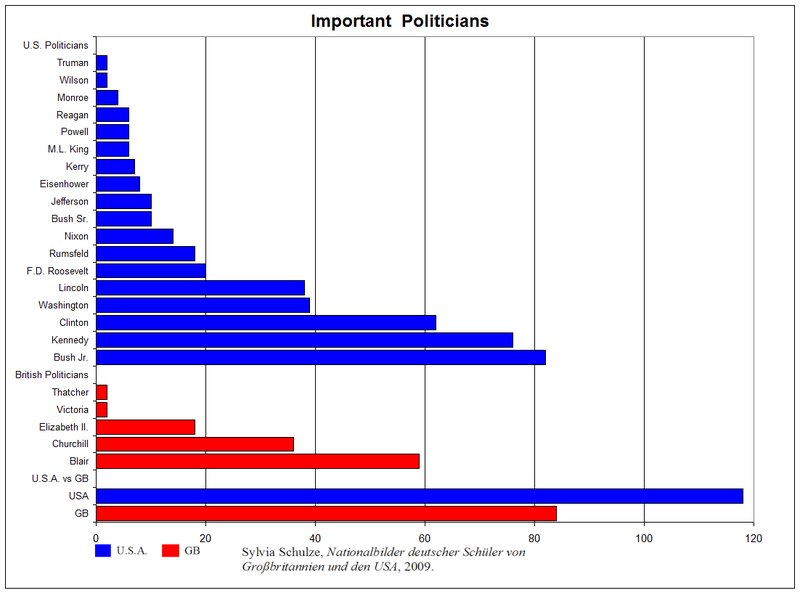 The survey shows that in comparison to the number of British politicians the students came up with, the U.S. fares very well. The students were able to list 18 Americans, but only five British politicians. The question remains how far the students’ knowledge extends beyond pure name recognition. Nevertheless, with this cautiously optimistic assessment of German students’ knowledge about the U.S. in general, let me proceed to the second part of this paper: Why should Abraham Lincoln be a school topic more than 200 years after his birth, and in what context could he be taught? 8In the fall of 2008, Professor Jörg Nagler and I jointly organized the already mentioned U.S. Embassy Teacher Academy on the topic of Lincoln’s Legacy: Nation Building, Democracy and the Question of Race and Civil Rights. The Teacher Academy was established in 2003 and works in cooperation with American Studies Departments at German Universities. Its goal is to bridge the gap between schools and the university, to include American Studies faculty in in-service teacher training and reach out to high school teachers mainly teaching grades 11 through 13 by providing new insights, better teaching materials and an English speaking environment. 9Our particular goal here goal was to (re)introduce Abraham Lincoln into the curriculum as one of the most influential Presidents of the United States at home and abroad and as “one of the few Americans whose life and words bridge time” (White 3). Based on the findings of the Teacher Academy, I would like to suggest the following approaches to teaching Abraham Lincoln today. discussions on the role of nation building and national identity. 12President Lincoln is generally considered a man of integrity with a moral core that led him to fight for what he believed to be morally, legally and ethically right. His convictions were based on reflection and re-evaluation: “The dogmas of the quiet past are inadequate for the stormy present. […] We must think anew, and act anew” (Lincoln). Lincoln realized for himself that if he took the Declaration of Independence literally—“that all men are created equal”—he had to fight for the freedom and liberty of all Americans. Exceptions could no longer be tolerated. Lincoln as a politician and as a person serves as a role model even today when role models are viewed with a very critical eye, especially in Germany for historical reasons, or are associated with celebrities. and to engage in social and political action. 14These are ambitious goals, and I am not sure if one can actually achieve them. But striving towards them is a worthwhile endeavor. To explore with students what it means to pursue what one thinks is right, what it takes and what it costs, what gave Lincoln the moral compass to take on one of the heaviest burdens of his time might provide some valuable insights and certainly material for reflection and discussion. 15Lincoln and his timeless words can be an excellent source for this. Materials on Lincoln are numerous, among them the results of the U.S. Embassy Teacher Academy mentioned above published in the American Studies Journal in the fall of 2008. The journal provides several approaches for classroom use such as Lincoln’s legacy in the context of evangelical religion and evangelical democracy; Lincoln’s image in the American schoolbook, an excellent overview of how Lincoln has been perceived over the decades; Lincoln in U.S. Movies and on U.S. television; his attitudes towards slavery and race; and civil war literature. To be realistic, there will not be time in the EFL classroom to include all approaches, but these contributions will provide teachers with necessary background information and some ideas on how to teach American history in an engaging way. The articles prove the significance of Lincoln until the present and explain to the foreign student today’s politics in a historical context. 16Lincoln is a topic worth exploring 200 years after his birth. Yet it takes good materials and the connection to present politics to make it a useful and exciting teaching module for young people in the EFL classroom in Europe. The problem remains that German, and my guess is, European curricula do not allow for much time spent on American history. There is a lot to cover already. In Germany, much emphasis is placed on teaching global issues and social context rather than historical figures. So how can we “smuggle” American Studies content into the European classroom? 17Sylvia Schulze suggests we concentrate on some “cornerstones” of American history and connect them with historical facts and events in other countries (99). Rather than focus on chronology in the upper grades, we should focus on the history of ideas. For example, when talking about democracy in Europe and human rights, we might look at the American Revolution, the French Revolution, the often forgotten Haitian Revolution and connect them, e.g., with the peaceful revolution in East Germany. This approach would connect students’ lives with the past and make history relevant. 18The same can be done with a historical figure like Abraham Lincoln by connecting him with President Obama, Martin Luther King, and other freedom fighters like Nelson Mandela or Mahatma Ghandi. History becomes personalized, more concrete and clearly more relevant for our students’ education and character formation. Even a discussion of the problematic “hero figure” might prove useful since none of the personalities mentioned above are one-dimensional and without fault. Also, while the term “hero” is commonly and liberally used in everyday language in the U.S., in Germany the term is heavily burdened with past ideologies. 19Ideologically applied in the Nazi years and then completely avoided in West Germany, overused in communist East Germany (e.g. “Held der Arbeit” [hero of the workplace]), the “hero” has emerged again in unexpected places. A 2008–2009 children television show on the state funded children’s channel KIKA called “Platz für Helden” (a place for heroes) engaged teenagers in community and social work, e.g. by motivating them to renovate a youth center or similar activities. The concept of “hero” slowly makes its way into popular culture and the German language again. The renowned Hamburg based Körber Foundation’s history competition on “Helden” (heroes) drew a record number of participants in 2009, although critics warned that such a topic might result in superficial and uncritical discussions (Körber Stiftung). Not only the number of projects, more than 1,800 were entered by students and teachers, surprised supporters and critics alike. The quality of the contributions was outstanding. In highly sophisticated and professionally conducted studies, students explored historic figures such as Bismarck, “everyday” heroes who saved their Jewish neighbors from the Holocaust, or people from their communities who helped save historic buildings. All contributions had in common that they looked at the concept of the “hero” critically. 20So perhaps it is time to take a critical look at the American presidency historically and politically since interest in the Obama administration nearing the end is still high in Europe. A recently published textbook called New Context 21 by Cornelsen publishing house includes a section on “Dreaming of Equality” with the American Dream being the larger context, a common topic in the EFL classroom. Yet, the section starts with a picture of the Lincoln Memorial and, unlike in my previous example, the students are given context – though brief. A CD complements the printed version. Students are asked, among other things, to develop a time line for the history of African Americans against which to check corner stones in U.S. history. I believe it is a good approach. 21A newsletter from Cornelsen competitor Klett Verlag, distributed via their website as a subscription specifically for teachers, focuses on “Abraham Lincoln: The Man Who Paved the Way for Obama’s Presidency.” Student exercises and background information are useful, but again the lesson plan is designed for the EFL classroom—which concentrates more on the interpretation of Lincoln and Obama’s speeches and supposed parallels between both Presidents rather than historical content. Maybe we will see more of ‘Old Abe’ in future German textbooks, and this is only the beginning. Bildungsstandards der Kultusministerkonferenz: Erläuterungen zur Konzeption und Entwicklung. Veröffentlichungen der Kultusministerkonferenz. Kmk.org. PDF. 16 March 2016. Günther-Arndt, Hilke, ed. Geschichtsbuch Oberstufe. Vol. 1: Von der Antike bis ins 19. Jahrhundert. 4th ed. Berlin: Cornelsen, 1999. Print. Körber Stiftung Forum für Impulse. “Helden: verehrt—verkannt—vergessen: Die Ergebnisse des Wettbewerbs.” Spurensuche 23 (2009). Print. Laschewski-Müller, Karin, and Robert Rauh, eds. Kursbuch Geschichte. Berlin: Cornelsen, 2009. Print. Lincoln, Abraham. “Annual Message to Congress, 1 Dec. 1862: Cocluding Remarks.” Abrahamlincolnonline.org. Web. 16 March 2016. Nagler, Jörg, ed. Lincoln‘s Legacy: Nation Building, Democracy, and the Question of Race and Civil Rights. Asjournal.org. Web. 16 March 2016. Schulze, Sylvia. Nationalbilder deutscher Schüler von Großbritannien und den USA: Eine empirische Untersuchung bei Gymnasiasten der Jahrgangsstufe 11. Saarbrücken: VDM, 2009. Print. Schwartz, Hellmuth. ed. Context 21—Starter. Berlin: Cornelsen, 2009. Print. Schwartz, Hellmuth, ed. New Context—Ausgabe B. Berlin: Cornelsen, 2007. Print. Weeke, Annegret, ed. Invitation to History. Vol. 1: From the American Revolution to the First World War. 4th ed. Berlin: Cornelsen, 2009. Print. White, Ronald C., Jr. Lincoln: A Biography. New York: Random House, 2009. Print. Wills, Christopher. “Thank you, Abe: Lincoln Helps Obama Win Presidency.” Pantagraph.com. 9 Nov. 2008. Web. 16 March 2016. Martina Kohl holds a Ph.D. in American Literature from the University of Mainz. She coordinates educational and cultural programs at the U.S. Embassy Berlin and is a frequent lecturer at the American Studies Department of Humboldt University Berlin. Martina also serves as Deputy General Editor of the American Studies Journal. Kohl, Martina. “Teaching Abraham Lincoln in the EFL Classroom: A German Case Study.” American Studies Journal 60 (2016). Web. 24 Apr. 2019. DOI 10.18422/60-14.